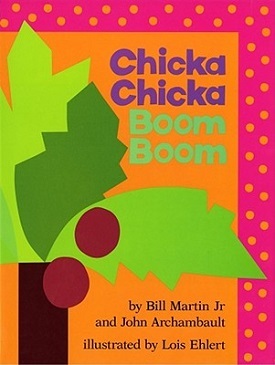 Chicka Chicka Boom Boom is a bestselling American children's book written by Bill Martin, Jr. and John Archambault, illustrated by Lois Ehlert, and published by Simon & Schuster in 1989. The book features anthropomorphized letters. The little letters, A, B, C, D, E, F, G, H, I, J, K, L, M, N, O, P, Q, R, S, T, U, V, W, X, Y, and Z climb a coconut tree in alphabetical order, until the tree bends so much, causing A, B, C, D, E, F, G, H, I, J, K, L, M, N, O, P, Q, R, S, T, U, V, W, X, Y and Z to tumble out of the tree. Capital letters (the older relatives of the letters climbing the tree) come to help them. Again alphabetically, it describes each letter's injury. At night, letter A comes back out and climbs up the coconut tree, daring the other letters to catch him. An audio book version is also available, narrated by Ray Charles. A CD-ROM version was released in 1995 by Davidson and Simon & Schuster Interactive. It inspired a 2004 sequel, Chicka, Chicka, 1, 2, 3. A board book for toddlers, entitled Chicka, Chicka ABC was published in 1990, containing the first half of the full story, which ends up with all 26 letters falling out of the tree. Weston Woods made an animated musical short film adaptation of the original book, with music composed and performed by Crystal Taliefero . 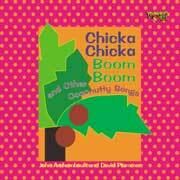 In 1992, along with musician David Plummer, Archambault released an album composed of several songs based on the storybook, entitled Chicka Chicka Boom Boom and Other Coconutty Songs. The album was named a 1992 "Notable Children’s Recording" by the American Library Association and in 1993, won a Parents' Choice Award. 1. "Chicka Chicka Boom Boom"
10. "Here Comes Another One"
11. "Saturday Night At The Fair"
13. "Knick Knack Dappy Whack"
^ "For Halloween, learning about skeletons, and some tips on the art of the pumpkin". The Sun - Baltimore, Md. Oct 14, 1994. Retrieved 1 March 2013. ^ "Notable children's recording". Emergency Librarian. Retrieved 1 March 2013.